PASCAGOULA, Miss., Nov. 18, 2011 (GLOBE NEWSWIRE) -- Huntington Ingalls Industries (NYSE:HII) announced that the company's sixth amphibious transport dock, San Diego (LPD 22), successfully completed her U.S. Navy acceptance trial this week. The ship returned to Ingalls Shipbuilding Thursday after a two-day sea trial. 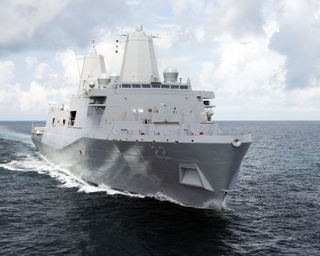 "It's amazing what 25,000 tons of steel can do sailing through the Gulf of Mexico," said Doug Lounsberry, Ingalls Shipbuilding's vice president and program manager, LPD 17 program. "These two days at-sea prove the excellent skill and craftsmanship of an Ingalls shipbuilder. It's teamwork at its finest, and presenting the ship capabilities to the Navy's Board of Inspection and Survey (INSURV) provides an opportunity to show off our shipbuilding talents. I am proud of our LPD 22 team and all of the shipbuilders who played a part in this trial's success." With the INSURV Board observing, Ingalls' test and trials team thoroughly tested the ship's main propulsion, steering, communications suite and deck missions systems. Many tests, including anchor handling, ballasting/de-ballasting the well deck and ventilation systems were performed while at sea. "The INSURV board had the opportunity to judge the ship's performance, and because of Ingalls/Navy collective efforts, we received very good ratings," said Richard Schenk, Ingalls Shipbuilding's vice president, test and trials. "The expertise displayed by the test and trials and program office team to ensure every exercise and test was achieved within a very short time period was great. We have very devoted folks who diligently prepared San Diego to be ready for these critical sea trials, and they are among the best in the business." Shipbuilders will spend the next month putting the final touches on LPD 22 before the amphibious transport dock ship delivers in mid-December. Ingalls has built and delivered the first five ships in the class and, including LPD 22, there are five more currently under construction.